Auto Efficiency: The Mileage vs. Safety Debate Since Americans first debated government regulation of the fuel efficiency of passenger cars, it has always come down to safety vs. efficiency: lighter cars get better mileage, the conventional wisdom goes -- but they're not as safe as heavier cars. Does that argument still hold water? Since Americans first debated government regulation of the fuel efficiency of passenger cars, it's always come down to safety vs. efficiency: lighter cars get better mileage, the conventional wisdom goes -- but they're not as safe as heavier cars. Thirty years after that debate began in the energy crisis of the 1970s, does the argument still hold water? Note: CAFE standards were in place for light trucks as early as 1979. Until 1982, automakers could comply with separate standards for two-wheel drive and four-wheel drive trucks. From 1982 until 1991, automakers could continue to comply with the separate standards or with a combined standard for all light trucks. Beginning in 1992, light trucks only needed to meet the combined standard. For the purposes of this graph, only the combined standard for light trucks is shown. The average fuel economy of new U.S. vehicles — a figure that counts both cars and trucks — jumped dramatically in the first 10 years after federal standards were introduced. 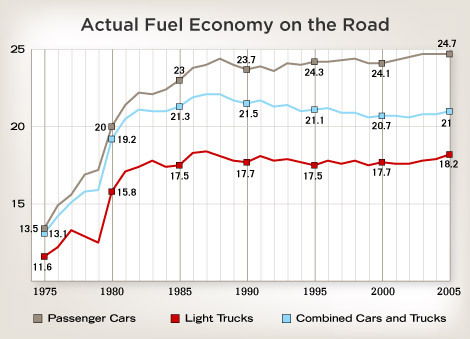 Improvements became sluggish from the mid to late '80s — and fuel economy actually slid from the late '80s to the mid-'90s. 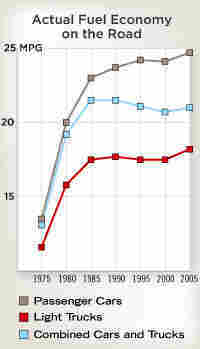 Since then, overall fuel efficiency hasn't budged much. The main reason: Americans have switched to driving bigger cars and trucks, which guzzle more gas than passenger vehicles. The Environmental Protection Agency has long been criticized for the testing procedure it uses to gauge fuel economy — which determines the mileage numbers that car shoppers seen on window stickers. The current EPA method, introduced in the 1970s, is based on outdated assumptions: that motorists drive slower than they really do, that they never use air-conditioning, never go up a hill, never start their cars in the cold, never get stuck in traffic jams, etc. In 1985, the EPA tried to account for some of the shortcomings in its lab-based tests by adjusting its fuel-economy numbers downward by 10 percent for city driving, and 22 percent for highway mileage. The revised figures were slightly more realistic, but critics argued that they still failed to account for real-world driving conditions that can drag down gas mileage. In early 2006, the EPA proposed going one step further, adding tests to simulate high-speed driving, rapid acceleration and stop-and-go traffic, among other factors. The new system will likely slash mileage ratings for many models by 10 percent to 20 percent for city driving. 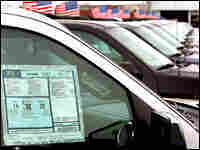 The revamped testing procedure is expected to be in place for 2008 models. The change will force carmakers to post lower mileage numbers on window stickers, but it won't affect whether they are judged to be in compliance with CAFE standards. That's because back when the EPA first revised its mileage numbers downward, automakers won a lawsuit barring the agency from using the new numbers for CAFE purposes. The Department of Transportation, which administers the CAFE program, still uses the overly optimistic numbers produced by the earliest mpg tests. CAFE standards — short for Corporate Average Fuel Economy — dictate the number of miles per gallon that an automaker should get for the range of vehicles it sells. Originating during the energy crisis of the 1970s, the standards represented the federal government's attempt at reducing fuel consumption by boosting the fuel economy of cars and light trucks. What are current CAFE standards? The current standard for passenger automobiles is 27.5 mpg. The standard for light-trucks — a classification that also includes SUVs under 8,500 pounds — rose to 22.2 mpg for model-year 2007 and will get bumped up to 22.5 for 2008 models. Why don't light trucks and SUVs have to meet the same fuel-economy standards as passenger cars? Light trucks and SUVs are subject to different fuel-economy standards because, when the standards were first conceived, lawmakers wanted to give U.S. farmers a break during the oil embargo of the '70s. Those breaks remained in place long after the embargo disappeared. The Bush administration has taken small steps to correct this. Rules that went into effect in April 2006 will boost fuel-economy standards for light trucks by an average of slightly less than 2 mpg over four years. The expected gas savings — an estimated 10.7 billion gallons of gas over the next two decades — is less than what Americans now use in a single month. What's the fuel-economy standard for a Hummer? Actually, there is no standard for a Hummer. That's because really big vehicles — those weighing more than 8,500 pounds — aren't covered by fuel-economy standards. When the standards were first developed in the '70s, lawmakers assumed that any vehicle that large would only have industrial uses. They didn't foresee that an American family might actually cruise around in a behemoth the size of a Hummer or a Ford Excursion, which get ghastly gas mileage. The Hummer is not officially tested for fuel efficiency, but reports suggest it gets a measly 11 mpg. Have CAFE standards been successful in boosting fuel economy? 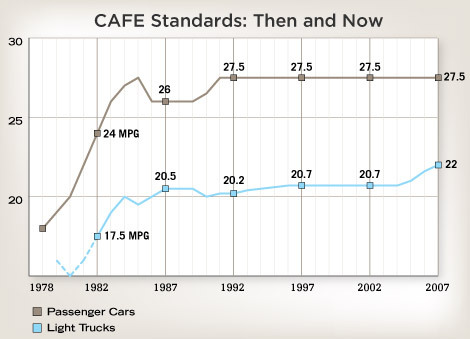 CAFE standards led to a dramatic surge in fuel economy in the first decade after they were introduced. 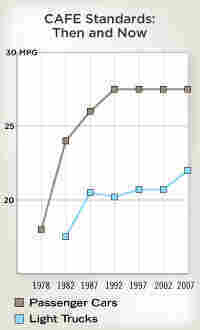 But starting in the mid-'80s, improvements became sluggish. And from 1990 to 2005, the average fuel economy of new vehicles — both cars and trucks combined — actually declined slightly. The reason: American drivers have increasingly switched to driving SUVs and trucks (they account for half of all new vehicles sold), which guzzle more gas than passenger cars. What's the argument for raising fuel-economy standards? One argument for higher CAFE standards is that the standards have barely budged since the 1980s. Supporters say the program would be more effective if lawmakers raised fuel-economy requirements, given that new technologies make better gas mileage quite feasible. But critics say the whole program has failed; they want to do away with the standards altogether. Lawmakers who want to reduce U.S. dependence on foreign oil argue that boosting fuel economy in transportation — which accounts for about 27 percent of U.S. energy consumption — would go a long way toward that goal. Environmentalists note that easing our addiction to gas would reduce air pollution and help fight global warming. What kind of existing technology could make vehicles more fuel efficient? Technology already exists to make vehicles get at least 10 more miles per gallon; supporters of raising fuel-economy standards say it could be incorporated into cars in a cost-effective manner. One study found that, when gas costs more than $2.30 a gallon, technologies that raise fuel-efficiency to around 33 mpg across the fleet pay for themselves within three to four years. According to Tom Cole of the Center for Automotive Research, even big cars could save a lot of fuel with improvements, such as six-speed automatic transmissions, cylinders that shut down when they are not needed, and improved aerodynamics and materials. For an extra $1,000, Cole says, a conventional, gas-powered car could go 25 percent farther on a single gallon of gas. What are the arguments against higher CAFE standards? Struggling U.S. automakers argue that raising fuel-economy standards could push them over the financial edge. They say that higher fuel-efficiency standards could add thousands of dollars to the manufacturing cost of each vehicle; these costs will be higher for U.S. automakers than for their foreign counterparts, whose fleets are already filled with lighter, more efficient trucks. Thus, the argument goes, higher fuel-economy standards would lead to financial losses and job cuts. CAFE supporters counter that the world's demand for oil — especially in places such as China — is increasing, but its supply is inexorably dwindling. They say American automakers need to get on the fuel-efficient bandwagon if they are to remain competitive with their Japanese counterparts. Opponents of higher fuel-economy standards often cite safety concerns. They argue that, in order to meet tougher standards, carmakers would be forced to make smaller, lighter vehicles — and these are more likely to crumple in a crash. CAFE proponents cite a 2001 study by the National Academy of Sciences that concluded the fuel economy of passenger cars and trucks could be boosted cost-efficiently and without compromising safety. They also note that SUVs are less maneuverable than passenger cars and have a history of being more prone to rollovers.